I’m a believer in cakes for birthdays. A candle in the middle of a brownie or a set into a scoop of ice cream doesn’t work for me. I appreciate all sorts of sweets on other days or for other occasions, but on my birthday, there needs to be cake. Even if I bake it myself as I usually do. And, luckily, I had just read a review copy of Grandbaby Cakes by Jocelyn Delk Adams right before my birthday. I had several new cakes to consider making. Both the book and Jocelyn’s food blog of the same name came about from memories of her grandmother’s made-from-scratch cakes and kitchen lessons. The cakes in the book include options for every level of baker from beginner to experienced, and each one comes with a story about the recipe’s origin. There are basic layer cakes, pound cakes, sheet cakes, baby or mini-size cakes, celebration cakes, and seasonal cakes for holidays. In the Pound Cake chapter, the Apricot Nectar Cake is a recreation of a recipe from the author’s aunt and sounds delicious with the nectar in both the cake and the glaze on top. The Peach-Raspberry Cake has a pretty ombre effect in frosting that changes hue as it moves down the layers. Pineapple Upside-Down Cake is reinterpreted as cupcakes, and they’re decorated with dried pineapple slices that look like flowers. The Mango Swirl Carrot Cake with mango puree added to cream cheese that’s baked into the top of the cake is a carrot cake variation I need to try. A serious contender for my birthday cake was the Strawberry Sundae Cake with the alternating layers of vanilla cake and strawberry ice cream. 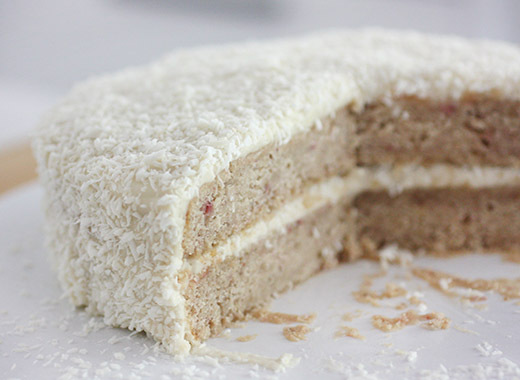 But, in the end, I chose the Strawberry Coconut Cake with strawberry puree mixed into the vanilla cake layers and shredded coconut covering the cream cheese frosting. I’m not sure when it happened but at some point in the last 20 years or so, the standard for layer cakes seems to have become three layers rather than two. For a household of two people, that’s a lot of cake. I almost always reduce the quantities of ingredients and only bake two layers, and that’s what I did here. The cake batter is made with sugar, butter, pureed fresh strawberries, eggs, flour, vegetable oil, vanilla extract, and sour cream. Strawberry extract was suggested, but I didn’t locate any at the grocery store and left it out. Red food coloring is also an option, but I skipped that as well. The result was just barely pink cake layers, but the flavor from the fresh berries was the most important part. The frosting was made with cream cheese, confectioners’ sugar, heavy cream, and vanilla extract. I added extra confectioners’ sugar to firm it up a bit. For the coconut flakes, my favorite is the unsweetened kind. The flakes are smaller, but the flavor is all coconut without any extra sweetness. This was a rich and tender cake with the butter, oil, and sour cream, and it didn’t stand a chance of being dry even the next day. The strawberry puree gave it great flavor too. Cream cheese frosting is always a winner, and the coconut flakes dressed it up a bit. This was everything I wanted in a birthday cake. And now I want to bake all those other cakes for other occasions too. Recipe reprinted with permission from Grandbaby Cakes by Jocelyn Delk Adams, Agate Surrey, 2015. Big Mama's Coconut Cake is famous. You may think this is a tall tale, but people would literally line up in front of her home just to get one for the holidays. Her cake’s highlight is a heavenly meringue frosting, which she whips by hand. I adore her classic, just like its legions of fans do, but I had a bit of fun updating it. The cake now has an exciting strawberry flavor; the pink layers burst against a bright white frosting with a tangy cream cheese accent. It is such a fantastic way to liven up a coconut cake recipe that has not only been around the block but looks mighty fine for her age, too. Preheat your oven to 350°F. Liberally prepare 3 9-inch round pans with the nonstick method of your choice. In the bowl of your stand mixer fitted with the whisk attachment, cream together the granulated sugar and butter on medium-high speed until nice and fluffy, about 6 minutes. Meanwhile, place the strawberries in your food processor and puree until smooth. Set aside. With your stand mixer running, add the eggs 1 at a time, combining well after each addition and scraping down the sides and bottom of the bowl as needed. 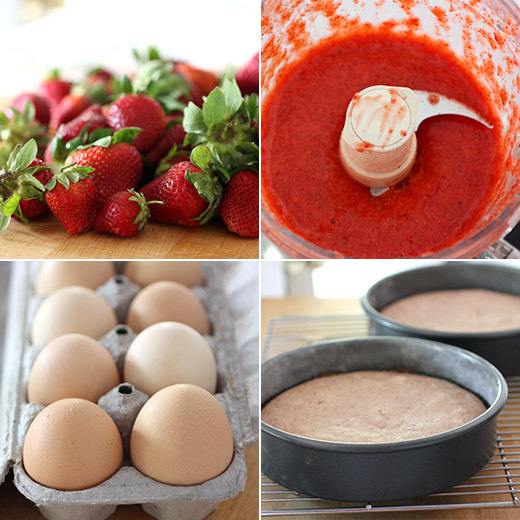 Change your mixer speed to medium-low and add the strawberry puree slowly into the batter. Continue mixing while you tend to the dry ingredients. 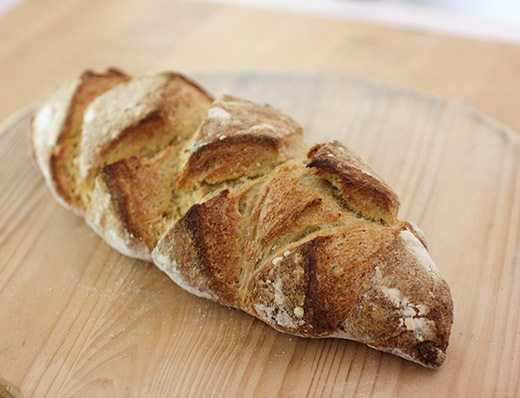 In a separate medium bowl, whisk together the flour, baking powder, and salt. Slowly add 1/2 of the flour mixture to your stand mixer bowl. Continue to mix on low speed to combine. Meanwhile, in a small bowl, whisk together the sour cream and oil and add to your stand mixer bowl. 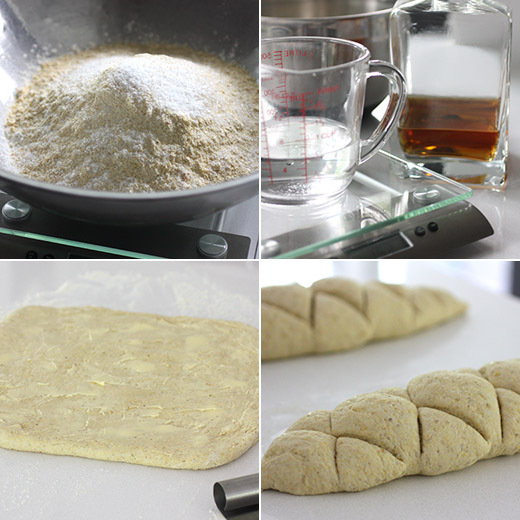 Pour in the remaining flour mixture and continue to mix on low until well incorporated. Add the vanilla extract, strawberry extract, and food coloring, if using. Scrape down the sides and bottom of the bowl and mix the batter until just combined. Be careful not to overmix. Evenly pour the batter into the prepared pans and bake for 23 to 28 minutes, or until a toothpick inserted into the center of a layer comes out clean. Let the layers cool in the pans for 10 minutes, then invert onto wire racks. Let cool to room temperature. Lightly cover the layers with foil or plastic wrap so they do not dry out. Clean your stand mixer bowl and whisk attachment. Beat the cream cheese on high speed until it begins to thicken and become fluffy. Turn your mixer down to low speed and carefully add the confectioners’ sugar. Once the sugar is fully incorporated, turn your mixer speed back to high and continue whipping. Add the heavy cream; vanilla extract; coconut extract, if using; and salt and continue to mix until a smooth, light, and fluffy frosting is achieved. Once the layers are completely cooled, place 1 layer on a serving plate. Spread just the top of the layer with 1/3 of the frosting. Add the second layer and spread with another ⅓ of the frosting. Add the final layer, bottom-side up, and spread with the remaining frosting. Frost the top and the side of the cake. 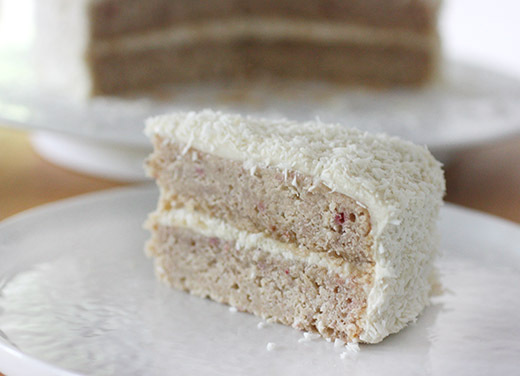 Gently pat the side and the top of the cake with coconut flakes. Serve at room temperature. A book about noodle, rice, and dumpling dishes reconsidered from an entirely vegetarian perspective was something I knew I was going to like. After reading my review copy of Bowl: Vegetarian Recipes for Ramen, Pho, Bibimbap, Dumplings, and Other One-Dish Meals by Lukas Volger, I couldn’t wait to try several things. Dishes like ramen and pho have always presented a stumbling block for me both at restaurants and in cookbooks because although they often include lots of vegetables, the broth is usually red meat-based. Here, at last, is an entire book devoted to making meat-free versions. For the brothy dishes, there are recipes for vegetarian dashi, vegetarian pho broth, and vegetable stock. There’s also a recipe for vegetarian kimchi since it traditionally contains fish sauce or dried shrimp. In fact, there are recipes for every component of the dishes like pickles, flavored oils, chili-garlic sambal, and even homemade ramen noodles. The chapters are organized by type of starch. So, there are wheat noodle bowls, rice noodle and rice bowls, other grains bowls, and dumpling bowls. The Vegetarian Curry Laksa looks delightful with the spicy broth with coconut milk, the fresh green beans and cherry tomatoes, the shredded cabbage, and hard-boiled egg. There are bibimbap versions for every season, and they all include instructions for making a crispy base that mimics the results of the bottom layer of crusted rice when served in a traditional dolsot. The Grilled Vegetable Couscous Bowl with tofu, eggplant, corn, and tomato looks perfect for summer, and I’m looking forward to trying the Black Rice Burrito Bowl with black beans, chiles, lime juice, mango, and avocado. I didn’t mark pages in the dumplings chapter because I want to make them all. Chickpea Potstickers, Kabocha Dumplings, Rich Lentil Dumplings, and all the rest sound delicious. 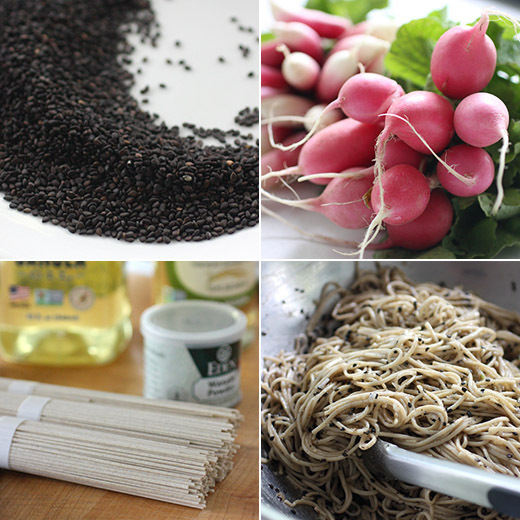 Right away, I set about making the Black Sesame Noodle Bowl because it incorporates radishes, and this is the height of their season. Black sesame seeds were toasted in a dry pan and then coarsely ground with a mortar and pestle. After transferring them to a mixing bowl, canola oil, soy sauce, rice vinegar, wasabi powder, and salt were whisked into the mixture. Eggs were hard-boiled, and tender greens like spinach leaves, radish leaves, and some pretty mache I found at Boggy Creek Farm were prepped. Soba noodles were cooked, rinsed, and drained. The drained noodles along with some minced shallots were added to the mixing bowl with the sesame mixture. To serve, greens were placed in bowls and topped with the noodles followed by sliced avocado, radishes cut into matchsticks, sliced green onion, shredded hard-boiled egg, and the top was drizzled with a little soy sauce rather than the kecap manis suggested. I loved the flavors of the dressed noodles which got even better as the noodles sat. 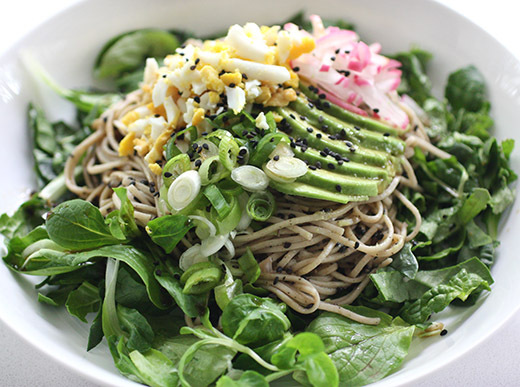 The egg and avocado added richness, and the green onion and radishes made it fresh and spunky. This was quick and easy to prepare, and the leftovers were a treat for lunch the next day. There are so many great ideas in this book, I might need to buy more bowls since I’ll be using them even more often. Recipe excerpted with permission from BOWL © 2016 by Lukas Volger. Reproduced by permission of Rux Martin Books/Houghton Mifflin Harcourt. All rights reserved. Place the sesame seeds in a dry skillet and set over medium-low heat. 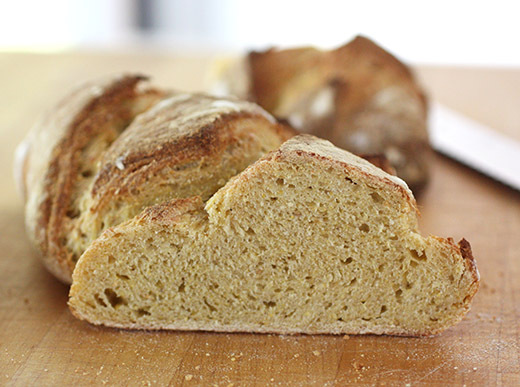 Toast, swirling the pan frequently, until fragrant—90 seconds to 2 minutes. Watch and smell carefully so that they don’t burn. Transfer to a mortar and coarsely grind, then transfer to a mixing bowl. Add the oil, soy sauce, vinegar, brown sugar, wasabi, and salt, and whisk until thoroughly combined. Bring a saucepan of salted water to a gentle boil. Add the noodles and cook until tender, usually 4 to 7 minutes or according to the package instructions. Drain, rinse thoroughly under cold running water, then drain again thoroughly. Add the noodles and shallots to the bowl with the sauce and toss well, until the noodles are thoroughly coated. At this stage, the noodles can be transferred to an airtight container and kept in the fridge for up to 2 days. Bring to room temperature before serving. Quarter the avocado around the pit. Remove and peel the segments, then slice into thin strips. Peel the eggs and grate them using the large holes of a box grater. Slice the radishes into thin rounds. Stack the rounds on top of each other and slice into thin matchsticks. Divide the greens among four bowls, then top with the dressed noodles. 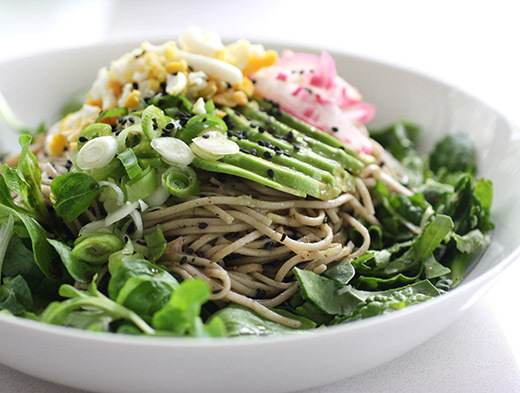 Fan the avocado over the noodles in each bowl, then add a pile of the shredded egg, radishes, and scallions to each serving. Drizzle a bit of kecap manis over the avocado and serve.